Is there a best time to visit Yosemite National Park? The answer to that question depends on what you want to do. Be ready to hike, gaze and wonder! Summertime has been long known for being the most popular time to vacation. School is out for 10 weeks, the mood at work can be a little more relaxed, and adventure seems to beckon from every corner. Every summer, you and the family try to do something a little different than the one before. You typically either do a week at the theme parks or the beach. And while you appreciate the getaway in any form, you want something different that your family hasn't done before. The National Parks across the country have been doing a big promotion to entice visitors to choose nature over cartoon characters. If you would like to do some more exploring, then a back to nature theme would definitely shake things up. Also, you may decide you want to go check out Yosemite National Park because you vaguely remember your grandparents taking you there as a child. You just don't know when the best time to visit Yosemite during the summer will be. What are the best sites to put on your must-see list? You want to make sure your family is prepared and as psyched up for the adventure as you are. Yosemite is one of the largest national parks in the United States, and trying to find the best sites to see can prove to be time-consuming and challenging. That's why we've taken the time to put together the highlights you should be prepared to hit once you get there. Furthermore, we know that your time is valuable. And when it comes to planning a trip with the family, stress can sometimes get in the way. We hope that this list can help take away some of the pressure you feel and allow you to unplug and unwind in one of the most beautiful parks in the country. To make your trip easier, you'll want to know when is the best time to visit Yosemite during your summer vacation. We'll get right down to business. Glacier Point has to be at the top of your list. It gives you and your family the best view of all the other points of interest you are going to want to check out These include the Yosemite Valley, Clouds Rest, Half Dome, and Yosemite Falls, just to name a few. Yes, in the summer, Glacier Point is fully accessed by Glacier Point Road. Furthermore, you can also opt to hike Four Mile Trail, which is a moderate to strenuous climb. Therefore, you may not want to take this route with small children or take grandma along on this one. During the summer, the trails leading up to Glacier point are packed with tourists. Try to head up on a Wednesday or plan a bus ride. Accordingly, the bus tour will take about four hours, depending on the other stops they make. Yosemite Valley is the staging point for all other areas in Yosemite National Park. The visitor's center, camping facilities, and the like can be found here. While the activity level is high in this area, don't forget to stop and take a good look around. The rock formations that form the walls were all cut by glaciers as they made their way through. This was back before humans ever existed. Additionally, you can catch a tour bus that will loop you around to various points of interest in the park. Catch a glimpse of Yosemite Falls (if it's still running) and take in the sites of Dome Rock and other landscape gems. Furthermore, there are a few hiking trails that loop around the valley. So, these are probably a good choice if you are traveling with small children. If you are up for a challenge, some of the hiking trails offer elevation gain and switchbacks. Tunnel View entrance is probably the way you got into the park, and it is the best way to access this center point. The entrance to the park can get quite crowded, especially on the weekends. We are warning you about that now. Some of the looping trails can also become more congested at this time. Just be patient and prepared to share the trails. The most popular waterfall in the park is undoubtedly Yosemite Falls. Rising up 2,425 feet above the valley floor, the waterfall spews water at its heaviest between May and June. It contains three tiers that keep the water from spraying out too far. Yes, you can hop a bus that will loop you over to the base of Yosemite Falls. If you want more of an adventure, take the Yosemite Falls Trail and hike your way there. This 2-mile loop makes slight elevation gains. And while it isn't necessarily recommended for small children, if you take your time, you'll be able to get them and you there and back safely. The most popular viewing spot at the base of Yosemite Falls is going to be crowded if the falls are still flowing. Obviously, the view might not be as impressive if there isn't water pouring out. If you have been anywhere near Yosemite, chances are you've already caught a glimpse or five of Half Dome. Perched up over 8,000 feet above, the dome appears to have been cut in half. The granite rock that makes up the dome is really just formed in two different shapes. One is a sheer drop straight down, and the other is the rounded smooth and dome appearance. Its distinct shape and looming appearance make it the best-known rock formation in the park. It has been photographed and used thousands of times in print and in movies. Some people claim it is the most notable rock formation in the country. If you want to try your hand at some serious hiking, you can attempt the Half Dome Hike. Be warned: It is the most strenuous hike in the park. The last portion of the hike attempts an ascent of Half Dome rock itself utilizing installed cables. It is one of the most popular hiking trails in the country for enthusiast hikers and rock climbers. Due to the popularity, the area can get crowded and permits are actually required. We're guessing with the family along, you'll want to pass. Half Dome is easy to see from various vantage points in the park. Maybe take the family on a casual hike around a loop trail in Yosemite Valley or the like. If you have been feeling too tall lately, take a stroll through Mariposa Grove in the south end of the park. That's because you'll walk among the giant Sequoias, some of the largest in the world. Mariposa Grove is home to over 500 trees. This makes it one of the largest natural forests of these beautiful giants in the country. The grove has been restored over the last two years in order to improve the area for the sake of the trees. As well as making it better for the visitors who make this must-see stop. There is a free shuttle from various points around the park. One part of the restoration project is a constant count of the visitors who visit the grove. Therefore, the area may be closed, depending on the number of people in it. Mariposa Grove just reopened in June 2018; therefore, we are going to guess that it's going to be a common staple for summer vacationers. If you are traveling to Yosemite with smaller kids, we wanted to make mention of a neat feature they might enjoy as well. The National Park Service has done a great job of making kids feel like seeing the park is fun and exciting. If you head to the visitor center, have your child pick up the booklet that points out various activities they should do while in the park. Once these activities are complete, stop back by and see a ranger about getting deputized. Yosemite National Park is open year round. The time you visit will impact what you have to see and do quite a bit. So, if you're limited to your summer family vacation, you'll want to know when is the best time to visit Yosemite. And, since you're planning a summer getaway, snow and cooler temperatures are out of the equation. Instead, we'll focus on the things you want to see and the ones you may want to avoid and, of course, the timing of it all. Firstly, the spring thaw really sets the stage for some amazing waterfall sightings. There are at minimum 10 waterfalls that begin to flow in late spring. That's because the runoff from all the melting snow in the mountains needs somewhere to go. Furthermore, if you have an interest in checking out any of the falls in Yosemite, you want to plan a June vacation. Most of the waterfalls stop flowing by early July. And by August, they are completely dried up. Additionally, summer is the busiest time to go anywhere on the planet that is considered a vacation destination. Yosemite is certainly not immune to this. It is one of the most popular parks for families in the United States, so it stands to reason lots of other people will be taking their kids while they are on break too. While the park is large and spread out, there are some standard attractions that can get quite congested, especially on the weekends. If you want to make the best of your trip, plan to see the most popular sights during the week. Even better, if you have the opportunity to steer clear of the park on the weekend, do that. If possible, the weekdays are the best time to visit Yosemite. And while we aren't saying there won't be anyone else there, it may just make for a little more elbow room along the hiking trails. Remember, Yosemite temperatures can get well into the 90s in the summer. And not all the trails and sights have shade or water on hand. So it's a great idea to bring refillable water bottles so you and the family can make sure you have enough to get you through. Bring sunscreen and wear hats. The weather in the Yosemite Valley is almost always bright and sunny during the summer. Stop by the visitor center when you enter the park to get information on seasonal activities. Some areas may be closed due to down trees, water, and unfortunately, wildfires. It's a good idea to talk to an experienced ranger once you're inside the park to help you put together a realistic idea of hiking trails and what you should and shouldn't do with the family. Other than the waterfalls and the crowds, any time you can visit the park is going to be the best time to visit Yosemite. Spending the summer hanging out and taking in one of nature's most beautiful creations is worth it. Yosemite National Park may be one of the best trips you can take with your family over the summer. There are so many beautiful and natural sights to see, so it's tough to even consider listing them all. Know that you won't be disappointed if you make this your choice for your summer vacation. Any time you can visit a park like this is the best time to visit Yosemite. Whether you want to try your hand at camping and hiking, take a dip in the Merced River, or walk among the giant Sequoias, exploring and adventure are always on-hand. Finally, summertime is definitely a peak season to explore the park. 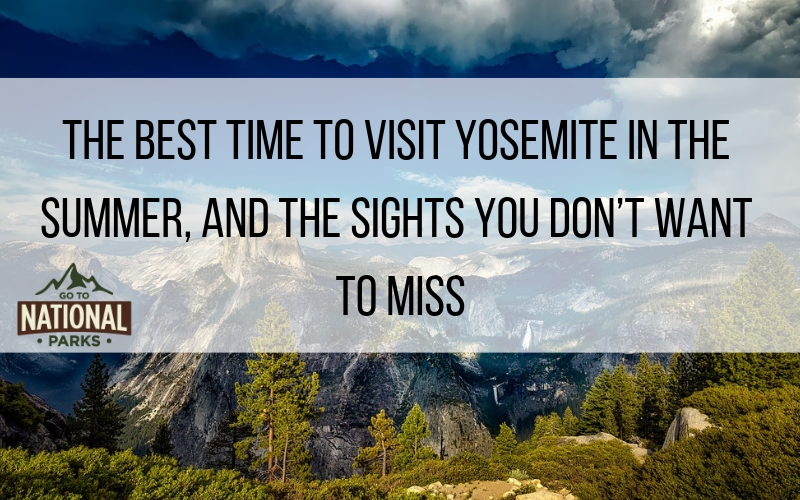 However, now you're armed with some basic facts about when is the best time to visit Yosemite -- like the fact that it will probably be crowded, and you should be prepared to wait longer at shuttle stops. Then, the trip will still be one of the best your family has taken to date.